Since yesterday (ed: the interview was done in early September 2011. This question was something like an introduction but after I got this great answer, I decided to share it with you), I got answers from Simon Kirke (Free, Bad Company, Ringo Starr), Dave Mattacks (Fairport Convention, Paul McCartney, George Harrison, Elton John, Brian Eno) and from Kofi Baker (Ginger’s son. He has played with Jack Bruce, Eric Sardinas, OHM). Wow!!! More heroes?! Ginger was my Big Hero when I was young, I had carved “Ginger is God” in the bunk beds I shared as a kid. A few years ago I was given a few CDs with Ginger’s son Kofi that we’re inspired. Dig this, the first big rock show I ever saw was Blind Faith (to see my hero Ginger) at Oakland Coliseum and the opening acts were Delaney and Bonnie with Jim Keltner and Jim Gordon and …Free! 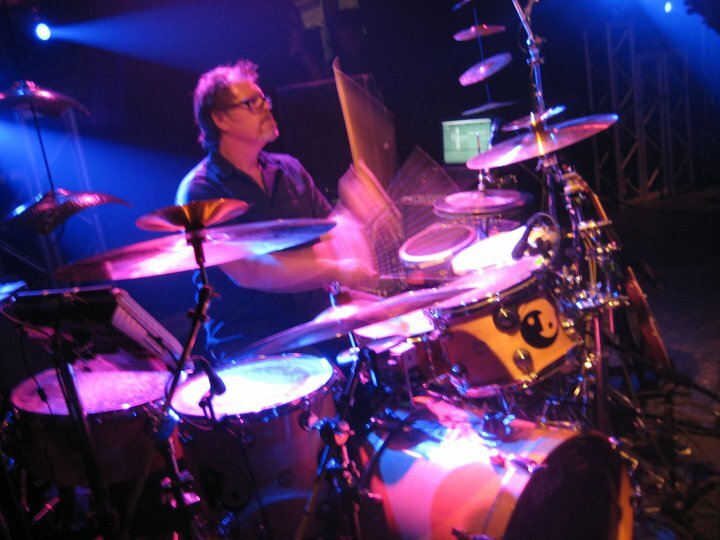 with Simon, that was the first time I ever saw a drummer play like that, with 8th notes pumping on his left foot and cut time with his right hand.. I was about 13 and I went right home to try and find that Simon Kirke feel. You just returned from Sardinia where you played in a Jaco Pastorius Tribute Festival. Did you enjoy that event? Was this your first time there? Yes, this was my first time in Sardinia and I didn’t see much, my flight connection was 5 1/2 hrs late and then had medical emergency over Atlantic and had to land in Dublin , the crew had timed out so we spent the night near the airport in Dublin and then continued to Rome at 5am. . As everyone knows Rome is a very disorganized airport and as you could guess I arrived at gig just in time for soundcheck but without my bags ( that carry my gear)- so I didn’t have any electrics, no samples, zip, natta! In factm I didn’t even even have a pair of sticks.-since 9/11 they don’t allow in cabin, so I borrowed 3 very small sticks from another drummer there, like 7A or 11A sticks. I usually play with exteneded 2B’s.. Still it was a very fun gig, getting to reinvent parts on the fly.. By the way wearing the same clothes for 48plus hours was not so great.. Yes my bags arrived, the following day , about 5 hours before I started my flight home. One special thing for that show was I made some samples of Jaco, about 10 phrases, some cut up and retimed to play as ostinatos in 5/8 and 7/8 while others added a chime like harmonics and low sub pulses. . I used that from my laptop inside the improvisation section of “Slow Glide”. I hope some one caught a youtube of that. You are about to tour in a few weeks with your friends Adrian Belew and Tony Levin. Which are your expectations from this tour? Will you release something with these people? We’ll release something! Something like the inner joy of making music with friends,- how about that. We’re not planing on recording if that what you mean. But I hunch people will be filming and bootlegging the shows since that impossible to stop these days.. I guess that is my expectation (laughs)! That people will spend more time futzing with the recording devices than participating in the moment.. Yep, that’s my expectation, lt’s hope i’m wrong. You participate in new Steven Wilson (Porcupine Tree) solo album. Did you enjoy recording with one the most talented musicians of our time? Ya man, Steven is great to work for/with.. Very talented and full of great ideas and also very open to new ideas- really shockingly nice and normal guy. Do we have to expect anything new from your projects TU and KTU with Trey Gunn? KTU is sort of asleep for now, there will be a repackage of the first record “8 Armed Monkey” and some video footage- but the project isn’t ready to do any new recording, it’s disappointing that we had our best gig ever last year in Perm Russia, it was a one off gig with short rehearsal and the show played well and was very satisfying.. the sort of show I’ d love to see touring all over the world but we ‘re expensive since we take surround sound and excellent lighting designers. TU on the other hand is pretty easy , its just Trey and I, no crew , and we adapt fast to each gigs unique situation. Last April we did two gigs that added Chrysta Bell to the TU show. Chrysta is a girl I’ve been working with for the last 6 or 7 years, jeeze I think we’ve done 4 or 5 projects/recordings now that are in the pipeline once she gets her record with David Lynch released. I also had Trey join me up in British Columbia a few months ago while I was there recording with Paul DeVilliers , Paul is the co-producer from my Mr Mister band, and other stuff we did together like Marc Jordan and Kim Mitchell -Paul has built a very nice studio up there so I took a few projects (as data) up to Paul’s place to play with for a week and then Trey joined for a few days and we started what I think will be our next TU studio record.. Might take a year or so to finish since we have no budget and we’ll be fitting it in around other work. 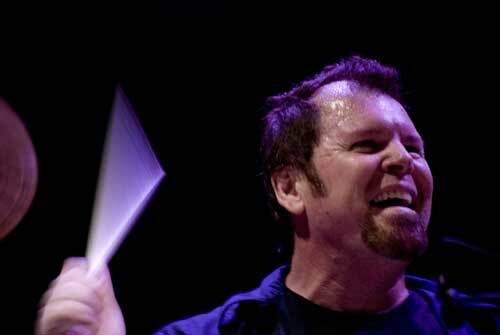 Which are the latest news from King Crimson camp (if there any any)?We ‘d love to see you tour and record again! No new words. I’d love to see the band active again too! How much scared do you feel in HoBoLeMa with all those legends?Was it the first time you played with Terry Bozzio and Allan Holdsworth? Ya , I know what you mean, but what’s really humbling is we don’t have material, we just improvise- each night looking to pull rabbits out of the hat. How the project came about? Terry (ed: Bozzio, has played with Frank Zappa and Jeff Beck just to name a few) and I started to play with about 15 years ago, casually for fun. . Then around 1999 we did a duo gig in Austin, then a couple years ago Terry rang asking if I’d like to do a couple duo shows in Japan ( He had Billy Cobham and Akiro Jimbo joining him as well) and that was a bit daunting so I asked to bring a rhythm buddy- Tony Levin. . We did the first 4 shows like that – then for the last two shows in Tokyo, Terry invited Alan and he said “yes”! So the first time we played was in Tokyo.. We all got on well and folks enjoyed the music– it was 100% improvised – – and a few agents started offering us tours. . Was difficult to schedule but we did eventually do 10 shows on the West Coast and another 20 shows in Europe.. We planned to do it again but keeps getting postponed.. Maybe again next year. Surprisingly enough, among your influences is Ringo Starr (The Beatles drummer). In my opinion (and not only mine) you’re a lot better drummer that Ringo (he’s just wealthier than you).What do you like the most in his playing? Easy there- Ringo is the greatest!! Maybe not the fastest, but come on, he help make some of the greatest music of our generation, “Come Together” or “Rain” alone make Ringo monumental in rock drumming..- He played the right part.. He totally served the music and in think thats the musicians job.. Help music come into this world. You’ve played with numerous great musicians. Is there anyone you’d like to play with and hasn’t happened yet?Maybe with Jeff Beck? Hendrix and Lennon but I’ m in no hurry (laughs)!! Ya how did you know I love Jeff Beck? I’ve always wanted to work with Jeff Beck- he and Hendrix were my original guitar heros. . 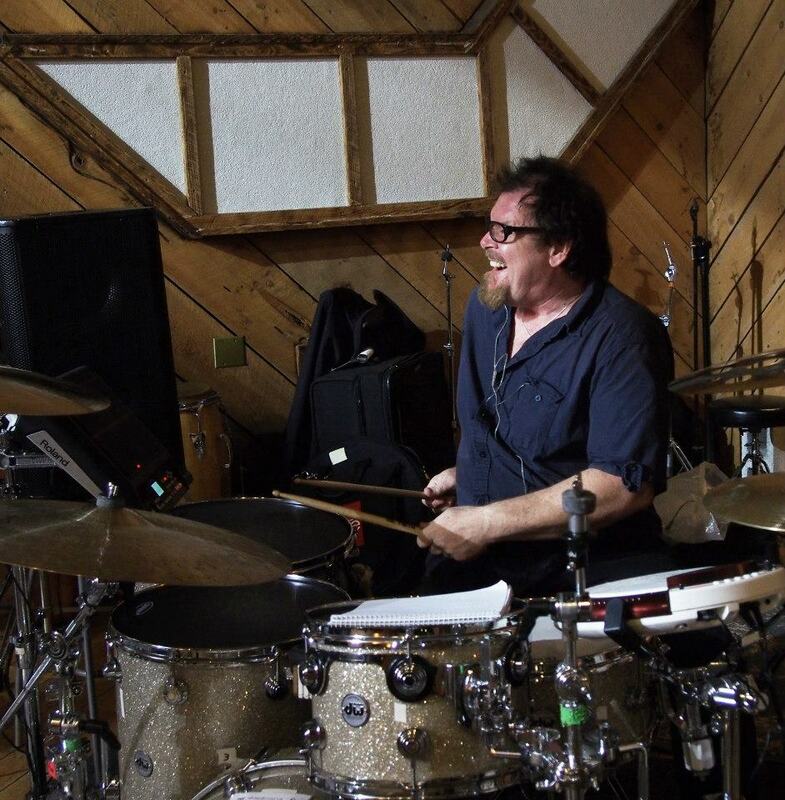 I grew up on “Beck-ola” and Mickey Waller (Jeff Beck Group drummer) was a big influence on me from that record, “Gasoline Alley” (Rod Stewart), etc – – he was a very cool drummer, had a certain reckless and chunky sound he got that I often strive for. . I kind of like the drumming to be a little ruff around the edges. Are you frustrated by the fact that your albums don’t get mainstream attention in U.S and artists with less talent than you (like Dave Grohl in my opinion) are superstars? Woa, easy again, Grohl (Nirvana, Foo Fighters, Them Crooked Vultures) is awesome too- the guy really has the feel and attitude – Let’s be honest so much of rock and pop is not about the technique but it is about the attitude, that’s what’s carries our hearts away when we hear a good performance.. Some of these wizkid drummers with mind blowing chops are incredible to see on their own but can’ t seems to make listenable music with other musicians. Grohl is fantastic. You live in Austin, Texas. Have you ever met or played with Jimmie Vaughan and/or Roky Erickson? Nope. neither. But my girlfriend once got the call to clean Roky up for a photoshoot and dam that’s a nasty grubby smelly man. I wish all Americans travelled outside the USA. Have you ever been in Greece? Send a message to the Greek fans. No, I have not. Would love love love to come to Greece. I wish you guys good luck with your economy and your republic! 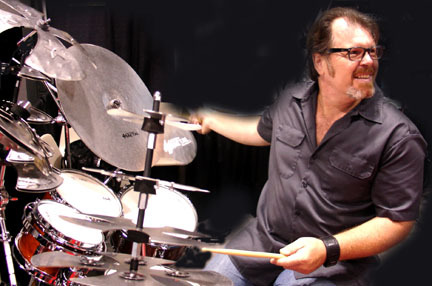 A huge “THANK YOU” to Mr Pat Mastelotto for all the great answers!! !